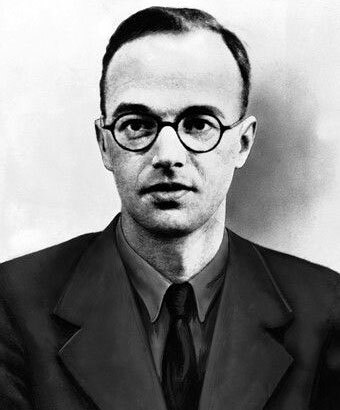 This is Klaus Fuchs. During the 1940's, he gave the Soviet Union, a US-British ally, information about the United States and British efforts to develop nuclear weapons. Fuchs' efforts finally came to light, and in 1950 he was convicted of espionage -- supplying military secrets to a country with which neither the U.S. nor Britain was, or had been, at war. Basically, treason consists of giving "aid and comfort" to the enemies of the United States. Fuchs could not be convicted of treason because the U.S. was not at war with the Soviet Union when he passed on its nuclear secrets; indeed, for much of the period, the U.S. and the Soviet Union were allies in the struggle against the Axis powers. Espionage is similar to treason, in that it also involves collecting evidence which a country wants to keep secret. In 1951, Julius and Ethel Rosenberg were convicted of espionage for transmitting "information relating to the national defense" to a foreign government -- the Soviet Union (again). Like Fuchs, they supplied information about the U.S.' nuclear weapons program; like Fuchs, their convictions were predicated on a traditional form of espionage, one that involved information that could be used to gain tactical advantage in the case of an armed conflict between two nations. Espionage offenses were historically a derivative form of treason. In 1996, the U.S. adopted the Economic Espionage Act (18 U.S. Code sectons 1831-1839), which expanded the concept of espionage to include the surreptitious gathering of information that could be used to gain economic, rather than military, advantage. The Act is unique; not only do other countries lack such legislation, but many countries actively engage in economic espionage. This includes countries that are otherwise allies of the United States, such as France and Israel; each year, a report is submitted to Congress which documents the extent of these activities. The Economic Espionage Act was intended to combat these activities by criminalizing them. It prohibits the theft of "trade secrets," which are defined as a "formula, practice, process, design, instrument, pattern, or compilation of information used by a business to obtain an advantage over competitors within the same industry or profession." Unlike treason or conventional espionage, economic espionage focuses on "civilian" information; it is predicated on the recognition that countries compete economically as well as militarily. Indeed, many argue that we are currently engaged in economic warfare with various countries, including China. I discuss this and other aspects of economic espionage in a law review article this will soon be published by the Houston Journal of International Law. The article should be available online at their website. If you want to read more about this, I suggest you read the article ("State-Sponsored Crime: The Futility of the Economic Espionage Act") . . . which should be online soon. The Economic Espionage Act creates two distinct crimes: 18 U.S. Code section 1831 criminalizes "economic espionage," which consists of stealing U.S. trade secrets in order to benefit a foreign government. So, a section 1831 offense occurs when, say, an Israeli agent steals confidential proprietary information from a U.S. drug company and transmits that information to sources in Israel, the goal being to improve Israel's ability to compete in this area. 18 U.S. Code section 1832 makes the theft of trade secrets a crime; it focuses on domestic activities, thefts that are intended to benefit individuals or entities within the United States. A section 1832 offense would occur if, say, research scientists working for Company A stole secret proprietary information from that company and used it to open their own, rival company. It results in the transfer of proprietary information to a foreign power, which erodes the U.S.' ability to compete in the global marketplace. The U.S. loses a tactical advantage in the evolving economic war among nations, just as it lost a tactical advantage to the Soviet Union when Fuchs and the Rosenbergs transmitted nuclear secrets to agents of that country. The point here is that economic espionage directly damages the country, while the theft of trade secrets generally damages a company. It is MUCH more difficult to control. In 1996, the U.S. decided that stealing trade secrets, or economic espionage, was of such significance that it warranted creating new criminal offenses -- criminal prosecution being the traditional means we use to control undesirable behaviors. As I have explained elsewhere, however, criminal prosecution is effective only against traditional, real-world crime. The domestic offense the Act created -- the theft of trade secrects -- is sufficiently analogous to real-world crime that criminal prosecution may be an effective means of dealing with it. (Though even here I have reservations, for reasons I explain in the forthcoming article I noted above). The economic espionage offense is very different, however, for several reasons . . . the most important of which being that it is state-sponsored crime. As I explain in the article I cited above, state-sponsored crime is not amenable to criminal prosecution even when it comports with the empiricial model of real-world crime, that is, even when it is committed by an individual agent of a foreign government who is physically present in the United States, physically misappropriates proprietary information from an entity in the U.S. and physically transports that information abroad. Criminal prosecution is generally futile in this scenario because the agent's activities are sponsored by a foreign government, which will almost certainly decline to return the agent to the U.S. for criminal prosecution. The futility of pursuing criminal prosecution becomes even more evidence when economic espionage is conducted remotely . . . when the agent of the foreign government hacks into a U.S. business' computer system, extracts data containing proprietary information and downloads it to a computer in the foreign country. Here, the U.S. has absolutely no chance of apprehending the perpetrator while she is conducting her nefarious activities. Its only chance to pursue criminal prosecution depends upon the agent's own country's being willing to surrender her for prosectution which, again, is extremely unlikely. It is unlikely because the agent was, after all, operating on behalf of the foreign government; it is therefore as unlikely that the foreign government would give this civilian spy up to be prosecuted as it is that the U.S. would surrender a CIA agent who had been operating covertly in another country to be prosecuted for espionage by that country. It is also unlikely because, as I noted at the outset of this post, economic espionage is not regarded as a crime in most countries. It is a basic principle of international law that countries will not, and do not have to, surrender their citizens to be prosecuted in Country X for activity they conducted while they were in their own country and that was legal in their own country. This is a very long post, and this is a very complex issue. I think I will come back to it again, in another post. In the interim, you might want to check out that article.